BackyardConservative: A classic leftist. Caption Contest! A classic leftist. Caption Contest! Ludicrous. If it were up to LaHood we'd all be doing this all winter long. e bike and jogging path on the North Side as a cold front moves in. 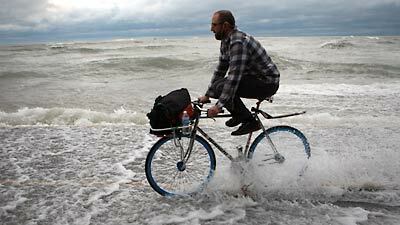 Preventing the seas from rising by going green in transportation. "Insurrection is an art, and like all arts has its own laws. . . . CATCH THE WAVE! WEEEEEEEEEEEEEEEEEEEEEE!!!!! HAWWWWW! Excellent. Get Trotsky in there.